This blog post provides an update on how GOV.UK Verify became available for users to file their Self Assessment in 2016. If you need support filing your Self Assessment for 2017, please contact HMRC if you are using Government Gateway. If you are using GOV.UK Verify, please get in touch with GOV.UK Verify's user support team. Each year around 2.8 million people file their own self assessment tax return online with HMRC. The deadline for this passed on Sunday 31st January. GOV.UK Verify is in public beta (it will go from beta to live in April this year), so it’s not yet scaled and ready to act as the main way for people to access their self assessment tax return. Most people still use Government Gateway to sign in and access the service. However, following a successful trial in 2015, this year HMRC has been providing GOV.UK Verify as an alternative for users who have lost both their username and password. Without GOV.UK Verify being in place, those users would have to wait for replacement credentials to be sent to them in the post which can take up to 10 days (whereas using GOV.UK Verify for the first time takes about 10 minutes). GOV.UK Verify was also available for anyone who wanted to use it - for example, if someone had used GOV.UK Verify to access another service during the year, they might choose to use it for self assessment as well. Over the course of the last year GOV.UK Verify verified more than 400,000 identities, and so naturally, some of these will have chosen to reuse their GOV.UK Verify accounts when filing their self assessment tax return. In 2015 more than 11,000 people used GOV.UK Verify to file their self assessment tax returns. At the time users were offered a choice between two certified companies, and the option to use GOV.UK Verify was less prominently advertised on the GOV.UK start page. The completion rate, which is the percentage of visits to GOV.UK Verify which conclude in a successful outcome, was 40.9%. Some users take more than one visit to verify their identity. The verification success rate, which measures the proportion of visits where users arrive back to GOV.UK Verify from certified companies having verified their identity, vs. visits that arrive back to GOV.UK Verify having failed, was 56% in the last week of January 2015. Since GOV.UK Verify went into public beta in October 2014, we have been working to improve the service to make it more straightforward for people to use. Certified companies have been adding new methods to verify identities, and improving their user journeys. 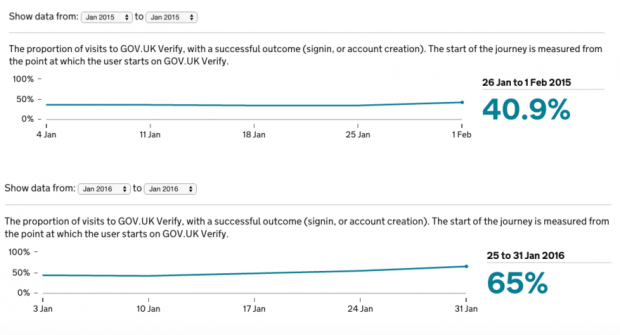 The GOV.UK Verify hub has also been improved through research and A/B testing. We can see the impact of this from last year to this year. This year, users could choose from 4 certified companies, each of which extended their customer support services over the final “peak” weekend to help users who were filing their taxes at the last minute. During January 2016, 53,100 new users verified their identity with GOV.UK Verify in order to file their self assessment, along with many who had verified throughout the previous year. In the final week of January 2016, the completion rate for GOV.UK Verify grew to 65%, and the verification success rate grew to 77%. Overall in January this year, people used GOV.UK Verify 196,504 times to access the self assessment service. Users typically sign in at least twice as they complete their self assessment. The growth in traffic this January took usage of GOV.UK Verify over another significant milestone. As of Saturday 30th January, there were over 1 million authentications since the service became publicly available. This means that users have used their accounts to access an increasing range of central government services over 1 million times since October 2014. As Service Manager, I would like to thank everyone who worked to prepare GOV.UK Verify for the self assessment filing deadline and those who provided support to our users, many of whom provided useful feedback. We’ll be using this to continue to improve the service as we work to take GOV.UK Verify from beta to live. What's the difference between 'completion rate' and 'verification success rate'? As Stephen describes above, the two rates cover different sections of the user journey. Success rate measures the outcome for users who are returned back to GOV.UK Verify from a certified company’s service whereas completion rate measures the ability of users to progress through GOV.UK Verify hub and successfully return from a certified company. GOV.UK Verify is in beta, which means it is being constantly improved and developed - at this stage, we are unable to verify people with overseas addresses as the database is not available to us for the certified companies to check against. I have the same problem like Rebecca. I am overseas, with a passport other than from the Uk. I just wanted to do my self assesment online, like the last three years. And I cannot verify. And it tells me "Cannot verify and to try later". It gives no other option and the help link simply brings you to general help on the SA. I've wasted half a day so far. The SA would have been done in 15 minutes. Am very frustrated with this. I consider sending a paper form. However, this is very unconvinient and may get lost with a deadline just in two months. How can I verify and file my SA online again? I am sorry to hear about your troubles trying to access your self assessment online. Have you tried to access it by using GOV.UK Verify? GOV.UK Verify may still be able to verify you with a non-UK passport if you have a UK address. If you return to the service and try to log in using GOV.UK Verify, you will be asked what identification documents you have and will be offered the option of certified companies that may be able to verify you with a non-UK passport. The link to self assessment is here: https://www.gov.uk/log-in-file-self-assessment-tax-return and the link to access GOV.UK Verify is four lines down. However, if you do not have a UK address, then unfortunately at this stage, GOV.UK Verify is unable to verify people with overseas addresses as the relevant databases are not available for the certified companies to check against. There will continue to be other ways for people to access services if we’re not able to verify their identity through GOV.UK Verify. If you haven't already, then please do return to the service you wanted to use and follow the guidance on the other ways that exist for you to access it. Thank you so very much for your reply. Am really surprised about this. And abbraciate it. And you gave far more usefull information then the Zenhelpdesk I contacted, too. The last three days I tried all the certified providers for GOV.UK Verify. Several times. I am at the point to give up. The other options to verify is always the same link for Self Assessment, that you also provided. And that does not give another solution. It just goes round and round in circle. I am at the point to give up. I cannot wast more days on this. I will send a paper form. Well, it was just too good to be true, the simple way I used the previouse years. Again, I really thank you for your answer. GOV.UK Verify is constantly being developed and improved based on feedback from people who use it. Thank you for taking the time to provide feedback. We are working to improve our service and that of our certified companies, so all feedback is valuable to us. I am sorry to hear you're having trouble. May I please ask if you were using Government Gateway or GOV.UK Verify? If you haven't been using GOV.UK Verify, which is an alternative way of accessing government services to Government Gateway, you'd might like to give it a try. To access it, go back to the service you were trying to use and select the GOV.UK Verify path. If you still find trouble, you can either get in touch with HMRC direct (https://www.gov.uk/government/organisations/hm-revenue-customs/contact/self-assessment) or submit feedback to GOV.UK Verify. The HMRC has locked out overseas users filing self-assessment altogether because the system cannot verify overseas users. I am staying abroad. I have only one passport, which is not a UK passport. The system has only one prompt: for my passport type. Select an overseas passport and it says it cannot verify. It is so unfortunate that the UK has forced roll-out of an incomplete system. For the past years, I have been filing my Self-Assessment online; to which the I can no longer be verified (since I am no longer in the UK) and can therefore no longer file online. This knocks overseas users back to the paper-snail-mail age of filing tax. What a shame for the UK government to take such a drastic backward step. I'm sorry to hear about your frustration. It appears you are using Government Gateway and not GOV.UK Verify. Whilst GOV.UK Verify is used as a secure login method for online government services, it is separate to HMRC's Government Gateway. Therefore I'm afraid I'm limited in the help I can give you. Just to let you know that in terms of accessing government services via GOV.UK Verify, at this stage, we are unable to verify people with overseas addresses as the relevant databases are not available for us to check against. However, many overseas residents still have addresses and assets in the UK, so there may be sufficient data for some people to verify. We do not wish to deter all overseas residents from attempting to verify, as this may exclude many people who could succeed. Therefore, if you still have enough assets in the UK you'd might like to try giving GOV.UK Verify a go as an alternative method to accessing your self-assessment. To do so, please return to the page (https://www.gov.uk/log-in-file-self-assessment-tax-return) and choose to sign in with a GOV.UK Verify account. I'm having the same issue as others on this page. I am an overseas resident trying to logon to pay my tax as I have done for years. However I am unable to verify using any of the certified companies and almost tearing my hair out in frustration. I can't believe im going to be forced to do this by paper from now. That's nuts. There will be some people with overseas addresses who we can't verify, as the relevant databases are not available for the certified companies to check against. For those unable to verify due to overseas residency and a lack of data available to the certified companies, this should be established quite early on in the verification process. Please accept our apologies if this was not the case for you. Nobody is excluded from a service if they can’t be verified by GOV.UK Verify. There will continue to be other ways for people to access services if we’re not able to verify their identity through GOV.UK Verify. If you haven't already, then please do return to the service you wanted to use and follow the guidance on the other ways that exist for you to access it. I'm a Chinese national, married to a UK national, living in the UK with a UK address. I can login to the government gateway, but then asks me if I have a UK passport, which I don't. It continues to ask questions about my home address which it accepts, then some more question about mobile companies and banks where I have accounts. I answer these simple questions but it always finishes by saying "There is a technical problem" "Please try again later in 5 minutes". Then takes me back to the verify page and just goes round in circles. Been trying for days but cannot get access. My husband just puts in his passport number, answers a few questions and logs in ok. What's the problem ? I'm sorry to hear you've been having difficulties. Before I can advise you further, can I please clarify that your problems have been using GOV.UK Verify, and not Government Gateway? GOV.UK Verify and Government Gateway are separate systems, and once I get clarity on which one you'd like support on I'll be able to direct you to the right place. Same Problem THIS IS URGENT! I am an Irish citizen, living in UK over 25 years, paying tax, using online self assessment for several years, but now I can't log in any more because of Verify. I'm trying to sign in to complete my self assessment. (I did it ok last year.) Today, I entered my userid and password ok. I got my access code by text on my mobile, and entered it. Then I was told that my identity needed to be confirmed. I don't have a UK passport, and so the HMRC website (black screen) asked my address and then I was asked a range of questions about my credit history. It failed saying "There is a technical problem" "Please try again later in 5 minutes". My full name is also displayed on the screen - so it does know who I am! Then takes me back to the verify page and just goes round in circles I have tried several times. Surely the point of 2 factor identification (mobile phone and password) is to prevent this kind of nightmare. Please help me to sign in. Thanks, Alan. PS the verify.gov system also fails every time when i have tried to view my driving licence details. It is not fit for purpose. I have tried again today and managed to verify my identity. It seems that the message 'there is a technical problem' should actually say 'you didn't answer the credit agency's questions properly'. c) buy something on hire purchase? I don't know what they call it, and it appears my answer was wrong, so therefore the website crashed out saying there is a problem, try again in 5 mins?? It's absolutely unfit for purpose. I read on the verify.gov website blog that they were delighted they had increased the success rate of the users to 70% This is nowhere near high enough (should be 99.99%) considering that 30% of people might be fined for not returning their Self Assessment on time! I am sorry to hear you've not had a smooth experience with logging onto your Self Assessment. From the looks of your comment, you were using Government Gateway (which is a separate system to GOV.UK Verify) and I will pass your feedback onto HMRC. In terms of GOV.UK Verify, as at November 2016, over 70% of people who try to verify their identity using GOV.UK Verify are successful. We consider around 70% to be a ‘good’ success rate and work is still ongoing. GOV.UK Verify is being constantly improved and developed based on feedback from users like yourself. In the longer term, to move significantly beyond 70%, we need more data to be brought into the system to give people a wider range of ways to prove their identity. Hi I made a account with the GOV.UK verify today,but it doesn't show the self assessment option on the list. Early today it was there tonight it's not is there a time period in between each visit? GOV.UK Verify is available to use when you need to access one of the listed services. From the service's start page, you can choose Verify as the method to log in. If you have already used Verify before, you select 'I've used Verify before', log in using your account with a certified company and then once logged in you should be taken back to the government service. My husband is trying to complete his self assessment, but unfortunately his passport expired so he is trying to go through the verify system. He keeps getting the technical issue and try later message. He has contacted HMRC, but they have said it isn't their problem. He has also emailed helpdesk and they have just sent back a standard reply which is of no help at all. He is now at a point he can't complete his self assessment as no one seems to be able to give him any useful help. I design website so the user experience is terrible and just sends people in a loop. This really needs to be reviewed along with the support info as you will have a ton of people who just can't complete their forms in time. I think you need to go back to the drawing board and review the journeys and support info to make is useful for people. In the meantime it sounds like he needs to contact HMRC to get them to verify him in another way whatever that means. Is this correct??? I'm sorry to hear your husband is having trouble. Before I can provide you with further help, can I first please double-check he has been using GOV.UK Verify (with the blue start page, with the list of certified companies that can verify an identity) or if he was using Government Gateway? If he has been using Government Gateway and has been finding difficulties, he may still be able to use GOV.UK Verify which is a separate service to Government Gateway. In GOV.UK Verify, one of the certified companies introduced a new method of verification meaning that if you have a bank account and a credit or debit card, you can now verify your identity without a passport. I am a UK taxpayer but I will have to complete my self-assessment whilst I am overseas. Will I still be able to receive the 2-step verification text whilst I am overseas? Yes, if you are using GOV.UK Verify you will still be able to receive text messages whilst overseas to log into your identity account. It is utterly rediculous that I must now have a mobile phone AND A MOBILE PHONE SIGNAL to complete my tax return. What happens if I use a phone that does not accept text messages. Would I get a phone call telling me the number? We do recognise that mobile signals are an issue and we are addressing this with new providers. However, you may still be able to use GOV.UK Verify. All of GOV.UK Verify's current certified companies use two-step verification. I am an Irish citizen living and paying tax in the UK. I have tried to register for the Government Gateway service a number of times. However, because I don't have a UK passport I am unable to verify my identity online. I am moving address in a week and wish to notify HMRC about this - can you please advise me on how to go about this? Hi, I seem to be having the same problem as Amy above. I have now tried both sites as you suggested to others. Using http://www.gov.uk, I manage to get, through all the questions, to the point that I can see my name and time when I last time logged in. So technically, I am logged in, but no features are opened to me. Bellow is the " we are experiencing technical difficulties, please try in 5 minutes" message. Using http://www.gateway.gov.uk/ allows me to log in and shows me my account. It states that I am enrolled for the SA service. When I click to that link, it takes me to the http://www.gov.uk site and my log in attempt there ends up as described above. I have been filling in a self assessment from abroad for past 5 years online and never had a problem. I need this to be resolved as I want to pay my tax preferably before the deadline! You've come through to the blog for GOV.UK Verify - an alternative way of accessing government services to Government Gateway. It has certainly been a frustrating and worrying experience for me and, I suspect, many others too. As a user, who is required, under threat of penalty payment for failing, to complete my self assessment under this system, I am horrified that you think 70% success is in any sense satisfactory and on the path to improvement. This seems incredibly complacent to me. 2) Change the error message generated by the verification system. At the moment the failure produces an error message which seems to say the service is down and you should try again in 5 minutes. If I understand what happened (at least in my case), the system should have said my answers to the credit reference agency were unsatisfactory, and then gone on to say that further questions would be asked or a different method would be offered. 3) A clear link on the failure page to urgent/live assistance should be offered. It took me some time to find this discussion after considerable searching. It took you 12 hours to reply. At this time of year, it is not good enough. Most people with these problems are simply trying to pay their taxes in the proper manner, and a delay could lead to them getting into trouble which is not their fault. It is still not clear to me why having put in place two factor authentication, you still feel it's necessary to add a further layer on top of it. At the top of the HMRC page there is a notice saying the system is in Beta. That means it is not yet fit for use. There should be a link to an alternative tried and tested method as an alternative. However, I would like to clarify my message on the success rates. This is in relation to GOV.UK Verify, and is not reflective of the experiences you're having with logging into your Self Assessment through Government Gateway. GOV.UK Verify is a new service that is live and enables users to complete digital transactions and uses certified companies to verify their identity. It is an alternative way to access government services. I was never given a choice of other login methods, so it's not really 'an alternative' (implies an element of choice, more than one option) as you say. Also I think you should really consider what the error messages given are, whether they are meaningful, or helpful to end users, and what page users land on after failure. You should route us to an alternative login method (the previously functioning one for example). There is no point in being referred to a paper printout in late January, when there has been an online service running for several years. I do realise that there is probably a large team at gov.verify; when I criticise 'you' I am not being personal, I am referring to the whole team/project. I do mean thank you (personally) for your time and for your replies. PS in reference to the driving licence fiasco, I have complained in writing on the website and on the phone several times, to no avail. I can't get online access to my driving record. The verification fail has the same problem as here, the message is effectively:'not working' but there is no indication as to why. When I call the DVLA in Swansea, they give me a manual code but they have no idea what the system error is, or how to fix it. Instead of having a green paper counterpart licence which was valid for about 40 years, I now have to request a code over the phone about 5 times a year (for foreign car hire) and then go online an print out a fresh copy of my licence records. (most foreign car hire agencies have no facilities, no appetite or don't understand how to use a sharing code, so they sometimes want to see a recent printout! They usually don't bother, but the terms and conditions say that they can refuse to hire out a car if you don't have the record, so the risk isn't worth taking. What an utterly useless system we now have! Gone from one piece of paper for a lifetime to 5 pieces per year! I will certainly pass these comments on to HMRC. Feedback is always valued. Thanks for the links you provided, they're very helpful. From these, I can see that you are trying to sign into the service via Government Gateway and not GOV.UK Verify. On this page (https://www.gov.uk/log-in-file-self-assessment-tax-return) there are two ways you can access Self Assessment online: through Government Gateway and through GOV.UK Verify, which is found below the green 'Sign in using GOV.UK Verify'. To access GOV.UK Verify, you'll need to click 'Sign in with GOV.UK Verify' and you can then create an identity account with a certified company who will verify you are who you say you are, before you'll be able to access the service. This service offers two different online services, and GOV.UK Verify is an alternative to Government Gateway. Similarly, you'd might like to try GOV.UK Verify to View or share your driving licence information. On this service page, you can access GOV.UK Verify by clicking on 'other ways to apply' in the table beneath the green button. This provides an alternative way to access this service. How does the HMRC expect the average joe to remember what bank credit card/store card they opened in 1999! Can you believe it. I'm in IT and develop systems for public use; who seriously thought this through . They have to realise this is a waste of time, the website says BETA is bloody big characters; surely someone should realise there must be a choice to use the live site. I now find myself login in and after logging in successfully, it simply says "You've tried to verify yourself to many times, you can try again in 7 DAYS. note to the brain boxes at HMRC, its the 12th of January, the deadline is 31st January. Luckily I know I have submitted my returns, but surely you guys have to realise there are people out there who may need to file later. More importantly do you know think of the time, effort and absolutely ridiculous approach you are expecting the UK people to use. the issue is that I've gone through mine and my wifes and both allow me to login and then FORCE me to go through this absolutely crappy regime of identifying me!. Thank you for your feedback - it appears you have been using HMRC's Government Gateway. You've come through to the blog for GOV.UK Verify, and not to HMRC. GOV.UK Verify is a new service that provides identity proofing, verification and authentication services to enable individuals to access digital government services. It is a separate and alternative system from Government Gateway. I will pass this comment on to HMRC, as all feedback is valued.